Jeff Hook Studio Cartoon influences interview August 2017 from Planet Hook films on Vimeo. 20th July 2018, Interested in things sport? Jeff also had a casual gig at the Sports Hounds news site. You will find Jeff's efforts at Jeff's View. Worth a look! Fellow cartoonist Mark Knight's tribute to Geoff. See also fellow cartoonist George Haddon's farewell to Geoff and former Sun editor Colin Duck's obituary of Geoff. We have also received this drawn tribute to Geoff from American cartoonist Tom Kerr. Welcome to Geoff "Jeff" Hook's web site. Featuring a weekly cartoon, cartoon archives, book details, and other art work, there's plenty to see and you can still order artworks through the services page. The next cartoon will be up on 29th April with more to follow! The Whitlam Government. A tribute to one of Australia's most remarkable Prime Ministers. 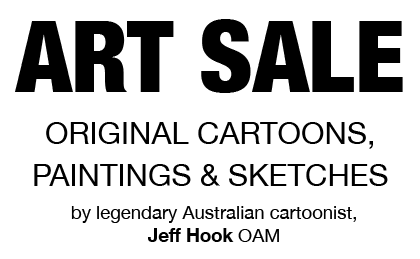 Relive one of the most turbulent times in Australian democracy and a great period of joy for cartoonists! Wonder as years of conservative rule end, thrill as Parliament is first broadcast live on television, despair at the collapse of the Government's finances, and gasp as the Government is dismissed and loses at the polls. Don't miss the Whitlam gallery. Views of Victoria and Tasmania. A further 27 paintings have been added to the realist art gallery, featuring works from some of Geoff's recent exhibitions. See the gallery here. ANZAC day, the 25th April, approaches. Another look back! Australian Veterans marched to commemorate ANZAC DAY and also the battles they had fought in the many theatres of war in France and Europe. French Nuclear Bomb tests were to go ahead in the Pacific region. "Mademoiselle from Armentières" was an English song particularly popular during World War 1. PS. A piece of trivia: if you look carefully at carrier of the RAAF flag, you may notice that it looks suspicously like a caricature of Jeff's colleague, Keith Dunstan. It is! Keith served with the RAAF in the Pacific during WW2.